Small Farmers’ Agri-Business Consortium (SFAC), which is slowly emerging as the nodal agency of FPOs in the country celebrated its silver jubilee in the NCUI Auditorium on Thursday. 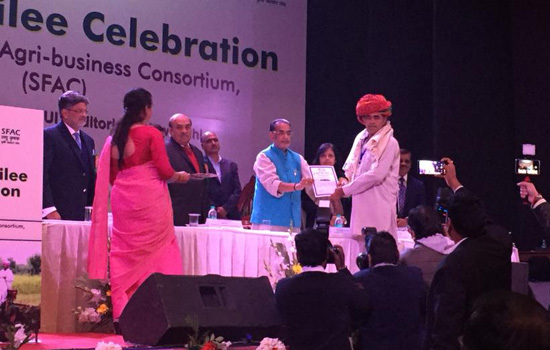 Union Minister of Agriculture & Farmers Welfare Radha Mohan Singh was the Chief Guest. Lauding SFAC, the Union Minister admitted candidly that FPOs developed by SFAC are doing better than those developed by the NABARD and the latter should take a leaf out of the former’s book. “SFAC is doing a commendable job in realizing Prime Minister Shri Narendra Modi’s dream of doubling farmers’ income by 2022”, Singh added. It bears recall that in order to encourage small, medium and marginal farmers, Farmer Producer Organizations (FPOs) are being promoted by the Government. In India, about 5000 FPOs are being formed by various organizations such as the SFAC, NABARD and State Governments. Giving partly an election speech, the Minister said that 551 FPOs have been constituted during 2014-18 by the SFAC, 147.09% more than 223 FPOs set up during 2011-2014. About 7.52 lakh small, medium and marginal farmers have been connected with FPOs, he added. Mrs Neel Kamal Darbari, MD of SFAC welcomed the guests and gave a brief introduction of the various activities undertaken by SFAC. She said, primarily aimed at making successful FPOs, SFAC runs various programs such as professional training, professional handholding, Delhi Kisan Mandi, FPO-Buyer e-interface portal and strengthening of basic infrastructure etc. Besides this, Equity Grant, Credit Guarantee Fund scheme and Venture Capital Assistance scheme are being implemented with the objective of making FPOs financially self-reliant, she added. Adding up the Minister said till now (since 2014), 349 FPOs have been provided capital subsidy of Rs 20 crore and in addition 38 FPOs have taken advantage of Credit Guarantee Fund scheme. Under Venture Capital Assistance scheme, 850 projects were given Rs 264.32 crore till 2014, which increased to Rs 404.45 crore in 1426 projects in the last 4 years. This has resulted in an impressive increase of 67.76% in projects and 53.03% in the Venture Capital Assistance amount. He added that SFAC is committed to benefiting more and more FPOs through e-NAM. Under this, 634 FPOs have been connected in 16 states to benefit small, medium and marginal farmers through e-NAM. Sanjay Agrawal Secretary, Department of Agriculture said that SFAC is not a small organization because what it does may prove to be a game changer for agrarian life. He asked the MD and her team to make it nodal agency of all the FPOs numbering 5000 presently in the country. “Prepare a vision document and put it before the Hon. Minister in 3 months”, he said to the MD from the dais. Rabo Advisor Rakesh Srivastava postulated the theory of ten pillars (Standard Practices) on which the co-ops can stand to compete with any commercial organization in the world. Some of the successful FPOs were also awarded on this occasion.